On the eve of Kyle's sentencing a year after Jamie's death, all the other "chosen ones" are coping in various ways. But our tenacious narrator is full of anger, stuck somewhere between the horrifying past and the unknown future as she tries to piece together why she gets to live, while Jamie is dead.Now she finds herself drawn to Charlie, Jamie's boyfriend--knowing all the while that their relationship will always be haunted by what-ifs and why-nots. Is hope possible in the face of such violence? Is forgiveness? How do you go on living when you know it could have been you instead? The Young Adult literary world is having quite the movement of its own. Authors are writing bolder stories that tackle real-life issues. They are breaking down barriers and giving voices to many. How She Died, How I Lived is no exception. 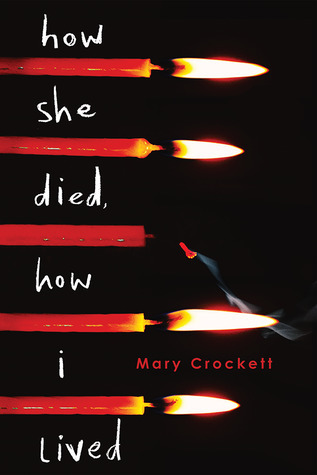 Mary Crockett penned an emotionally raw novel that will leave you thinking about it long after you've finished. The story tackles the aftermath of the violent murder of a teenage girl by a fellow classmate. The author does a tremendous job at capturing the emotional intensity of this story. She crafted multiple layers that provided a wide perspective of how each character was impacted. A small character cast adds to the overall tone of the novel. You don't get lost in too many side stories. It was just the perfect amount to achieve the emotion of the storyline. Aside from the subject matter, there was a light undertone that shined through that provided a bit of a relief at times. How She Died, How I Lived is more than just a story about death. It is about life after death. It's about the ripple of effect of those still left on earth. Even those affected who didn't quite know the victim that well. It's also a story about forgiveness. How forgiving isn't a weakness, it's a necessary step to moving on. It's about figuring out who you are now; since the person you once were has been ripped away from you. Or that person just doesn't quite fit right anymore. How She Died, How I Lived is an intense powerhouse of a novel.